Chiran"- Little Kyoto" SUBPAGE | All Japan Kyoto Association"
Minami Kyushu City is located in the southern part of the Satsuma Peninsula and is a popular sightseeing city welcoming 700,000 people a year. The historical Chiran Fumoto district is located in the central part of the city and a number of classical samurai residences still remain. With its beautiful traditional townscape from the Edo period, the city has been called the “Little Kyoto in Satsuma” for many years. What should be remembered about this city is that it was the location of a Japanese army military base during the Pacific War. Today, the Chiran Peace Museum is open on this site. Documents related to the war and letters written by young members of Tokkotai (suicide attack units) are exhibited. This is the place people can learn about the meaning of peace and Chiran is the city advocating peace to the world. From an agricultural aspect, Chiran is a top production area of Japanese green tea and has received a number of awards, including the Minister of Agriculture, Forestry and Fisheries Prize. The group of classical samurai residences in the Chiran Fumoto district belonged to Satsuma Castle’s domain. Today, seven Japanese gardens in the district are designated as sites of National Scenic Beauty. A number of items which belonged to the young member of the Tokkotai (suicide attack units during the war), their letters to the family, and notes are exhibited. With the theme of “Cultural Waves Crossing Each Other,” many cultural items from the Minami Kyushu and Ryukyu (Okinawa) areas are exhibited. A museum introducing the history of the end of the Edo period from the British viewpoint. A museum dedicated to Tome Torihama who was loved and respected as the Mother of Tokkotai (suicide attack units during the war) members. More than 10,000 dolls and figures from variety of historical periods are exhibited including traditional Imperial Style Dolls and toys and figures from the Showa period. About 200 large Buddhist carvings were made on the cliff’s surface in the Heian period. Largest five-story Buddhist stupa in Japan is also here. A fun leisure place with go-carts, BBQ, mini-golf, onsen hot spring, mini-animal park and many attractions for families on the highland. Visitors can try and enjoy some agriculture experience (making green tea) and 3D theater. Kamafuta Gankake Prayer is a unique tradition of how people visit this shrine and offer the prayer. 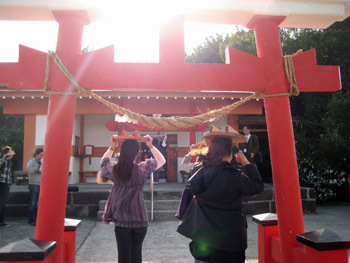 A person holds a lid of large cooking oven (kamafuta) on the head and walk about 10 meters from the torii shrine gate to the shrine hall. It is believed that this can prevent bad fortunes from coming to the person. Kamafuta-nage is another interesting tradition. A person throw a small lid of a pot about 3 meters above the pot. If one succeeds to let the lid get into the pot, it is believed that the person will become fortunate and healthy. 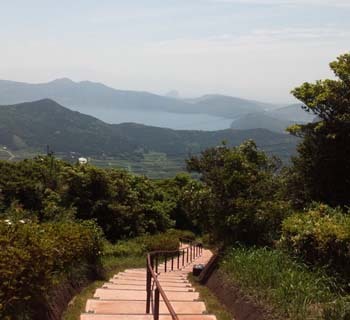 Along the National Road #226 and on the way down to the beach from Mizunarikawa, this park offers a superb view which was praised as the best scenery of Japan by Tadataka Ino, who created the first map of Japan in the Edo period. Especially, the view of Mt. Kaimondake, aka Mt. Fuji in Satsuma, is outstanding. The sea around the park is a habitat for seahorses. Because seahorses live as a couple, they are symbol of happiness, good health, good romantic match-making, a good relationship between husband and wife, and safe child delivery in Japan. 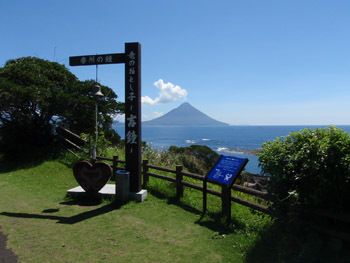 There is a bell “Kissho” in the park. Many couples visit here and ring the bell believing ringing the bell can bring them a happy romantic relationship and safe child birth. Seahorse House in the park is Japan’s only seahorse cultivation center accepting tourists. 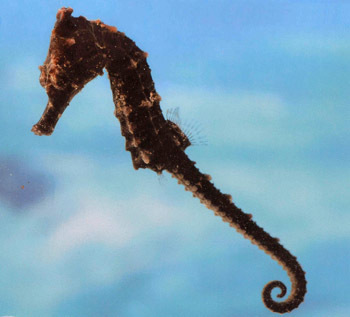 The seahorse is such a mysterious creature because it is the male who lays eggs. Enjoy watching pretty seahorses up close. A local market with a 230-year-long history. About 400 shops and stalls will be set up along the street and many people enjoy them. People pray and console the spirits of 1036 war dead who lost their precious lives as the members of Tokkotai (suicide attack units) during the Pacific War. This show of puppets and tricks is operated by waterwheel power. Stories are based on Japanese myths and folk tales. An important cultural heritage only found in Kagoshima Prefecture. Seven large Neputa (large paper float; 5 meters high and 4 meters wide) of powerful samurai figure will parade around the city accompanied by the festive sound of drums and whistles. A large parade made up of floats, music, children, mikoshi portable shrines and dancers will pass along the shopping street. In the evening, about 2,000 fireworks will adorn the night sky. Gossoi is a dialect in the region meaning “all together.” Citizens of Chiran become “Gossoi” and enjoy this big festival. About 2,500 fireworks will be sent into the night. Little Kyoto in Kyushu will come together and display local products and specialties. Samurai parade and local folk entertainment shows are also performed. The mild climate and rich natural environment produces good quality Japanese tea. Chiran produces the largest quantity of Japanese tea which has won first prize in many competitions. Fresh-baked sweet potato (Chiran Beni & Beni Satsuma) are selected as the Kagoshima Brand. Kawanabe Beef is a name of the brand which is given only to the cattle raised for over 15 months on the farm. It is the Level 4 grade certified by the Japan Meat Association.